TITAN Laser – Eine Legende ist wiedergeboren! Heller und leistungsstarker 3-Chip-Laserprojektor mit einem überraschend günstigen Preis. Der Digital Projection Digital Projection TITAN Laser 37000 WUXGA liefert 37.000 Lumen aus einem relativ kompakten Gehäuse heraus und ist damit der ideale Projektor für die anspruchsvollen Anwendungen in großen Räumen. Wo helle, gestochen scharfe Bilder benötigt werden, sollte es keine Kompromisse geben. Dabei hilft das Kontratverhältnis von 18.000:1 und die WUXGA Auflösung zusätzlich. 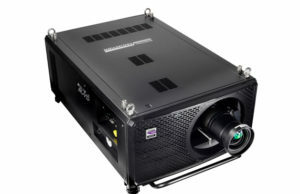 The Digital Projection TITAN Laser 37000 delivers 37.000 Lumens from a relatively compact chassis, making it the ideal projector for the most demanding of large-venue applications. Where bright, pin sharp images are required there should be no compromise. This class-leading 3-Chip DLP projector utilises the very latest in connectivity, including DisplayPort, HDMI 2.0 and HDBaseT. The advanced electronics also bring HDR processing to the large venue class of projectors, and features such as Constant Brightness Control and DMX Art-Net compatibility make it the idea solution for high profile events and fixed installations. As would be expected for a projector in this class, the TITAN Laser comes with features such as Non-linear Warp, Geometry Correction, Edge Blending, Picture in Picture and much more as standard. Users of the TITAN Laser in live environments will also benefit from the real time clock for on/off automation; email alerts and PC based central control software. An optional lens adaptor allows a variety of non-Digital Projection lenses to be used with the TITAN, thus overcoming the penalty of investment in new glass when upgrading to the latest projection technology.